"Our songwriters, composers, and music publishers are incredibly talented, creative and, in many cases, have had impressive longevity," said SOCAN CEO Eric Baptiste. "Tonight's gala masterfully and deservedly shone a bright light and celebrated them for the crucial role they play in defining our culture and the undeniable positive economic impact of their work. We are proud to honour their accomplishments and congratulate them for their SOCAN Awards." The 27th edition of SOCAN's Montréal Awards Gala was held last night (Sept. 12, 2016 )at the iconic Métropolis in Montréal as the who's-who of the music industry gathered to salute the careers and accomplishments of francophone songwriters, composers, and music publishers. The CULTURAL IMPACT AWARD was presented to French-Canadian songwriter Stéphane Venne for his legendary anthem "Le début d'un temps nouveau." Singer-songwriters Klo Pelgag, Pierre Kwenders and Loud Lary Ajust performed a bold version of the classic before a crowd of more than 400. Ariane Moffatt received the prestigious SOCAN SONGWRITER OF THE YEAR award, and was also honoured with a SOCAN POPULAR SONG AWARD for the "Debout." The international achievements of two young, extraordinary singer-songwriters, Coeur de Pirate and Grimes, were each honoured with the SOCAN INTERNATIONAL AWARD. Coeur de Pirate also received a POPULAR SONG award for her hit, "Carry On." The SOCAN LIFETIME ACHIEVEMENT AWARD was presented to Richard Séguin, one of Québec's most iconic artists, whose career spans four decades. To pay tribute to his prodigious contributions, a medley of some of his most famous songs was performed by Patrice Michaud (who himself won a SOCAN POPULAR SONG AWARD for "Je cours après Marie"), Elisapie Isaac, Luce Dufault, Coral Egan and Pierre Flynn. The SOCAN SPECIAL ACHIEVEMENT AWARD was presented to Alain Chartrand, the founder of the Coup de cœur francophone music festival. As the general manager and artistic director of this festival, which celebrates its thirtieth year in November, his passion and authenticity have made the event one of the most important in Canada thanks to consistently bold, high-quality programming. The inaugural SOCAN PUBLISHER OF THE YEAR award was presented to Ho-Tune, recognizing his significant contribution to the music community. Other highlights of the Gala included a tribute to Dédé Fortin and his Colocs by Guy Bélanger(harmonica) and Stéphane Archambault, Jonathan Painchaud, Philippe Brach, 2Frères and Alexe Gaudreault. 2Frères and Gaudreault also received SOCAN POPULAR SONG awards for "Nous autres" and "Placebo", respectively. Their songs "Dédé, La rue Principale," "Juste une p'tite nuite," "Passe-moé la puck" and "Julie," each an official SOCAN Classic, touched everyone who attended the celebration, which was directed by SOCAN member Yann Perreau. The evening also recognized the exceptional contribution of composers and publishers of music for film and television and their contribution to our economy. Award winners included Rudy Toussaint and his publishers, Éditions Marie Claire, ole, and Intermède Music, who received two awards, and Edouardo Noya Schreus who received the SOCAN ACHIEVEMENT IN FEATURE FILM MUSIC for his work on Xavier Dolan's "Mommy." 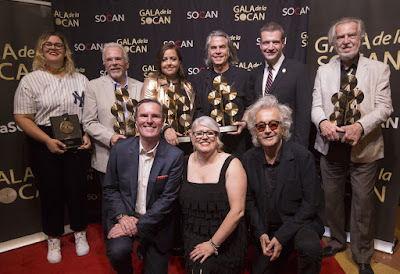 The songwriters, composers and publishers of 11 SOCAN CLASSICS awards – honoured for at least 25,000 radio plays – included several songs by the indomitable rocker Éric Lapointe, the late-lamentedDédé Fortin and his illustrious Colocs, Luc Plamondon and Nelson Minville. Performances of the newly certified SOCAN Classics by special guests surprised and moved the audience, with Fanny Bloom singing "Terre promise," Matt Holubowski making "N'importe quoi" his, and King Melrose rocked "Marie Stone," all three songs classics of Éric Lapointe's repertoire. Alfa Rococo revisited "Piaf chanterait du rock" (Luc Plamondon/Germain Gauthier), a song made famous by Marie Carmen. Roch Voisine transfixed the crowd with his interpretation of Luc Plamondon and François Cousineau's "Ma mère chantait toujours," followed by Jérôme Couture's interpretation of "Les bras de Satan," one of singer-songwriter Nelson Minville's biggest hits. SOCAN is a member-based organization that represents the Canadian performing rights of more than four-million Canadian and international music creators and publishers. SOCAN is proud to play a leading role in supporting the long-term success of its more than 135,000 Canadian members, and the Canadian music ecosystem overall. SOCAN licences more than 130,000 businesses in Canada, and distributes royalties to its members and music rights organizations around the world. SOCAN also distributes royalties to its members for the use of their music internationally in collaboration with its peer societies. Once more this year, each of the special awards laureates will receive the SOCAN Trophy, the industry's only major trophy that doubles as a musical instrument. This year, the trophy's five SABIAN-made crotales bedecking The SOCAN trophy will be tuned to play the first five notes of Le début d'un temps nouveau. Bance Avenue Éditorial/Les Éditions Gamma ltée. /Les Éditions Clan d'Instinct inc.
Éditorial Avenue/Les Éditions Gamma ltée. /Les Éditions Clan d'Instinct inc.
Les Éditions Clan d'Instinct inc. / Aldo Nova inc.
Plamondon Publishing/Les Entreprises L Mondon inc.
Éditions Dama inc. /Éditions et chansons du Suisse enr.